The gap between PR leaders' perceptions of their performance and their employees' views is "Grand Canyon-sized," a study finds. TUSACALOOSA, AL: Most PR leaders rate their own performance as exemplary, while their employees aren’t as impressed with them. A new study says the gap between the two perceptions is "Grand Canyon-sized." The Plank Center for Leadership in Public Relations and Heyman Associates surveyed 838 US-based PR executives in January and February to create a report card on the biggest issues among leaders in the profession. Leaders gave themselves an average of A- in terms of performance, while their employees gave them an average C+ grade. Execs received high ratings from staffers for ethical orientation and involvement in strategic decision making, but they earned lower marks for their vision, relationship-building skills, and team leadership capabilities. 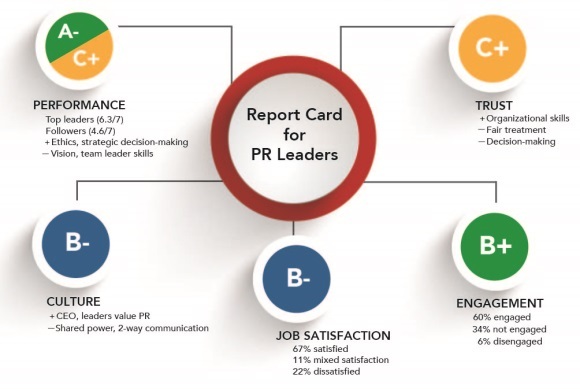 "The study results highlight the fact that there is more work to be done to make PR executives more effective leaders," said Plank Center research director Bruce Berger. Leaders can reduce the gaps by increasing power sharing, strengthening two-way communications, and enhancing interpersonal skills to enrich relationships and team work, the study suggested. The survey also found that participants gave trust in their organizations an average grade of C+, expressing less confidence in their companies to keep promises and show concern about employees when making important decisions. Job satisfaction among study participants garnered a B-. Of those surveyed, top leaders were most satisfied with their jobs than those at all other employment levels. PR pros at agencies were more satisfied than those working in-house for companies or nonprofits. "On almost every front, those who work in agencies were more trusting, engaged, worked in a more supportive culture, and rated leaders higher," noted Berger. "One possible explanation for this is that people tend to be more engaged when they are working in smaller units or smaller teams, which are common at agencies." Another factor could be that the CEO of an agency is typically a PR professional and the chief executive of a company or nonprofit usually is not. Because of this, a corporate CEO may have less of a focus on their communications mission than an agency leader, Berger added. Engagement received an overall grade of B+. The study found that 60% of PR leaders were engaged in their work, 34% were not engaged, and 6% were disengaged. Additionally, engaged PR pros viewed their organization’s culture as more supportive, rated leader performance higher, placed greater trust in their organization, and expressed greater job satisfaction. "Engagement and how it can be such a strong driver for our profession suggests to me when we are hiring, we think about trying to find people who are and who have been highly engaged," said Berger. "This can be used as a strategy to build engagement in your own organization."